For anyone who has already begun blogging, and for all those who are considering it, I think we can all agree that there’s something daunting about posting your work online. It’s like we store away all of this useful information and then second guess whether it’s enough. Whether we can write well enough. We worry that we’ll just be adding to the noise. I’ll admit, I’m pretty sure that I secured this domain about two months before I actually posted for the first time. It’s so easy to get wrapped up in all of the reason’s why you shouldn’t. We often forget or fail to even realise, all of the reasons why we should. Convincing yourself not to blog, just because there are already bloggers out there, is not a reason to stop yourself from trying! That’s like admitting defeat and waving the white flag before you know if there is a battle to fight. I blog because, more than writing, I love helping people. Since starting, I’ve realised that there are literally endless opportunities; such as being introduced to industry leaders, building your personal brand, teaching others, developing your own writing style, and so much more. We’re all unique individuals with our own set of trials, mistakes, difficulties and successes. No one has lived your life. It doesn’t matter if you’re one of thousands in your industry because none of them has experienced or felt they way that you have. So, they won’t be writing about it the way that you would either. You may have a way of writing that really strikes a chord with people who are in a similar place or experiencing the same sort of struggle. This is why your voice is important. It’s all about perspective and just because there are other people covering the same topic doesn’t mean that all of them have seen it from your angle. Content has one soul purpose. To solve issues and inspire. Try and remember any moment that you’ve hit a wall and needed a few tips. What’s the first thing you did? Google, search your favourite blogs, ask for another person’s opinion? This is exactly where blogging falls into place. You can share your experiences and help people who may be a few weeks or months behind where you are now. You don’t have to know everything to start writing. You only need to know as much, and more, than the people that you’re trying to teach. Imagine this, a few months ago I was finding it really difficult to come up with some ideas for blogging. Every week I would sit down and comb through my thoughts and struggle to put anything down on paper. So I read. I looked to others for inspiration. I didn’t google ‘how to produce new ideas – expert opinions only’. I didn’t care who the idea comes from. If wanted to connect with people who had shared and overcome the same issues that I was going through. Ten years of experience is great, but it’s not an absolute necessity. You just need a story that people can relate to. Your thoughts may just be someone else’s buried treasure. I’ve made this mistake, countless times. It’s hard when you look at really established brands like Social Media Examiner, Buffer and the Kim Garst’s of the world and think ‘damn I’d love to have all that traffic, those shares, likes and follows’. The grass is always greener when you’re just starting. Whenever you catch yourself falling into this trap, remember that they too had to work for it. They didn’t become successful overnight and once upon a time they were where you are now. At a blank page, a fresh website and world of opportunities waiting for them. Everyone starts from the same place. You’re at the beginning of your own journey – don’t compare your first chapter to someone else’s twentieth. I’m all for thinking an idea through. I mean, you want to make sure that your blog has a sense of direction. If you start talking about the brownie recipe you stumbled across one day and move onto how to be an entrepreneur the next, your audience will be more than confused. Just don’t over think it. Don’t let it turn into one of those side projects that never starts and collects dust in the depths of your mind. 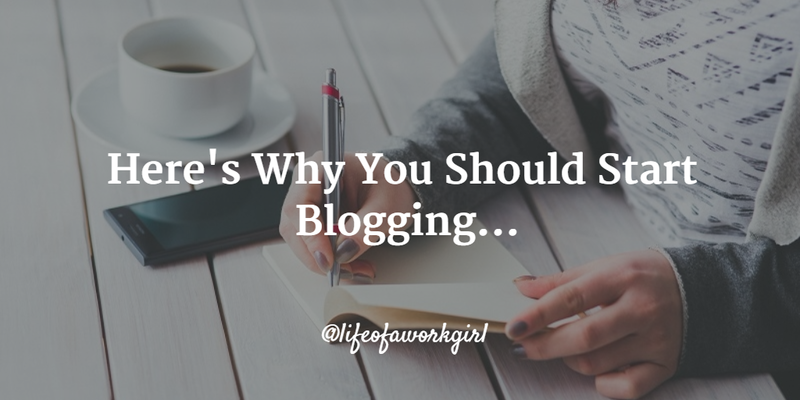 There’s a reason that you even considered blogging in the first place. So go with that instinct. Blogging can open doors that, otherwise, you had no idea of. And when you do get the ball rolling, don’t be afraid to share your work! Be proud that you’ve taken the first step. This is just the beginning.